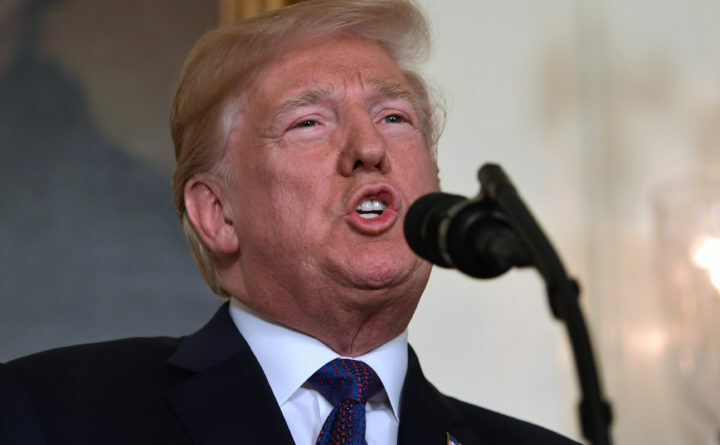 WASHINGTON – President Donald Trump attacked James Comey in a fusillade of tweets Sunday morning, calling for the former FBI director to be imprisoned as Trump served up a number of his favorite theories and alleged misdeeds without evidence. Trump’s tweets are part of a broader effort by the White House and the Republican National Committee to discredit Comey, who has written a damaging tell-all book called “A Higher Loyalty,” to be released Tuesday. A Sunday night interview on ABC News will kick off his national book tour and publicity campaign for the memoir. Comey’s book is a scathing depiction of his interactions with Trump, in which he likens the president to an “unethical” mob boss and casts his inner circle in largely unflattering terms. Trump fired Comey in May amid a sprawling investigation into his 2016 campaign and Russian meddling in the election. Comey’s firing then spurred a special counsel and a broader investigation into his campaign and administration – an investigation that now includes potential obstruction of justice and Trump’s business dealings. The book, obtained by news outlets and reviewed last week, has caused great agita for Trump. The president has also grown infuriated in recent days by the FBI raiding the office and home of Michael Cohen, his personal attorney. “The big questions in Comey’s badly reviewed book aren’t answered, like how come he gave up classified information (jail), why did he lie to Congress (jail), why did the DNC refuse to give server to the FBI (why didn’t they TAKE it), why the phony memos, McCabe’s $700,000 & more?” the president tweeted before 8 a.m. Sunday. Andrew McCabe was fired as deputy FBI director last month. The tweets were filled with unproven assertions. Comey has not been formally accused of disclosing classified information or lying to Congress. The memos Trump appears to reference are ones that Comey wrote memorializing his meetings and phone calls with the president – which have since become public. Comey asked a friend to give some of those memos to the New York Times, but the memos are not thought to contain classified material. Trump has continued to allege that McCabe was deferential to Hillary Clinton during the FBI’s investigation of Clinton’s use of a private email server because McCabe’s wife took donations from a Clinton ally for a state Senate race in Virginia. The accusation is one that McCabe has denied and has never been proven. Trump references a meeting that Bill Clinton – whom he calls “Wild Bill” – and Lynch had on a Phoenix tarmac in July 2016 that was seen as questionable, as Lynch was leading the investigation into Hillary Clinton. There is no proof, however, that Bill Clinton offered Lynch a job or a favor to ease off the investigation into his wife. The two said that their planes just happened to be on the same tarmac and that they made casual conversation after Clinton asked to come on board Lynch’s plane. “Unbelievably, James Comey states that Polls, where Crooked Hillary was leading, were a factor in the handling (stupidly) of the Clinton email probe. In other words, he was making decisions based on the fact that he thought she was going to win, and he wanted a job. Slimeball!” Trump wrote. It is unclear why Trump thinks reopening the probe into the email server would help Comey get a job with the Clintons. In fact, Clinton and her allies have resented the move and said it hurt her chances to become president. After an hour of trashing Comey’s character and reputation, Trump posted that he barely knew Comey, his favorite way of distancing himself from a contentious figure. “I never asked Comey for Personal Loyalty. I hardly even knew this guy. Just another of his many lies. His ‘memos’ are self serving and FAKE!” he said. The president soon turned his focus to the Cohen raid, an aggressive move by prosecutors in the Southern District of New York, who were referred material by special counsel Robert Mueller III’s team. “Attorney Client privilege is now a thing of the past. I have many (too many!) lawyers and they are probably wondering when their offices, and even homes, are going to be raided with everything, including their phones and computers, taken. All lawyers are deflated and concerned!” Trump wrote. In fact, Trump has struggled to find lawyers to handle Mueller’s probe of Russian interference in the 2016 election and any potential coordination with Trump’s campaign, and investigators in New York say they took Cohen’s materials in the Monday raid because his communications with clients could be part of the commission of a crime. A little after 9 a.m. Sunday, Trump returned his focus to Comey.